Wargame News and Terrain: Hexy Models: Hard City Miniature Board Game - New Blast Police Dog and FUBAR Mutant Inbound! Hexy Models: Hard City Miniature Board Game - New Blast Police Dog and FUBAR Mutant Inbound! Hexy Models' Hard City Kickstarter unlocked the first new miniature, the loyal Blast Police Dog which is a Kickstarter exclusive miniature now available as add on. Following as new stretch goal is the free FUBAR - massive mutant miniature! The Hard City Police Department wants to thank you all, brave citizens fighting together with us for the first 24 hours of the campaign. Hard City has been funded in an amazing time of under 7 hours, with two stretch goals unlocked so far! Thanks to your support, each core box will include a completely new Episode with Tesla Coil tokens and unique Cutscenes, as well as extra Skill cards to make your team's level ups even more exciting! 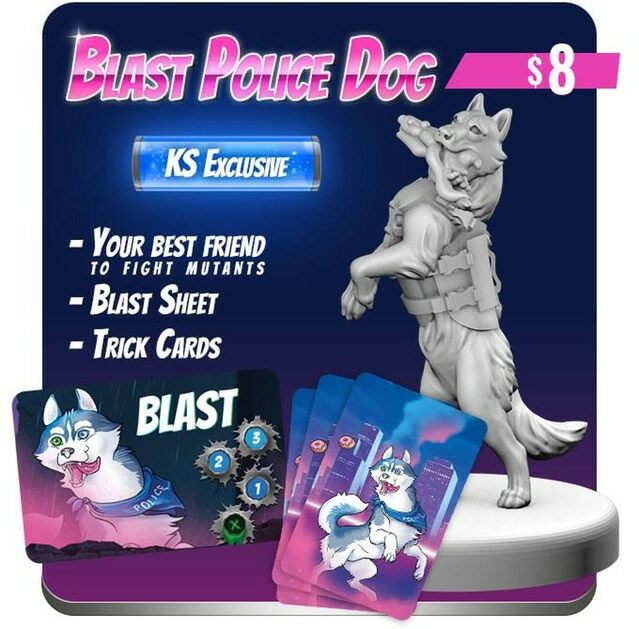 After the first day of the project, we also have a new add-on for you: Blast, the police dog with the Blast sheet and special Trick cards. Finally, a new stretch goal is now within sight. Well, it's quite big, so it would be hard not to see it anyway. If we manage to reach $60 000, each core box will also feature the huge, the ugly, the one – FUBAR, a new mutant with his own special rules! Spread the word, share the love for Hard City! Show our campaign to your friends, family and local police officers, as every new backer brings us closer to unlock this awesome green miniature for all of you - don't let it be gray anymore!